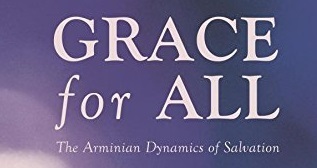 The first article in Grace For All is written by Roger Olson (blog), one of the most vocal theologians representing an Arminian view of God’s sovereignty and soteriology. Arminian Theology: Myths and Realities (amazon) and Against Calvinism (amazon) are two of the many books he has authored. In this essay, Roger Olson directly confronts the charge that Arminianism is a “man-centered” theology. He starts by quoting several Calvinist writers (including Michael Horton, James Boice, Al Mohler, and indirectly B.B. Warfield and Charles Spurgeon) that assert that Arminianism is focused on “human freedom” over “God’s absolute sovereignty”. What do these and other critics mean when they accuse Arminianism of being “man-centered”? The problem, according to Olson, is that when Calvinists make these assertions they are not dealing with Classical Arminianism but rather “popular folk religion” that is “semi-Pelagian” in nature and popular among evangelicals. But on all three points critics are wrong when it comes to Arminianism. Olson cites numerous works by Arminius to emphasize the point that Arminianism is a God-centered theology. In this post we will focus on Olson’s response to these first two criticisms. What would count as truly God-centered theology to these Reformed critics of Arminianism? In asking this question, Olson examines what it takes to consider “human depravity” and God’s sovereignty seriously according to Calvinists. But if we turn these criticisms around, as Olson does, then a view that is to be considered God-centered must hold that the “human decision plays no role whatsoever in salvation”. Rather God must “compel elect sinners to accept his mercy without any cooperation”. Olson’s observation seems fair given the Calvinist view is called monergism, which means the “work of one”. If our doctrine of total depravity is true, there can be no salvation without the reality of irresistible grace. at the decisive point. the salvation of man is in his own power … Thus the grace of God is fundamentally denied and salvation is committed, in the last analysis, to man himself. … it ends always and everywhere by transferring the really decisive factor in salvation from God to man. Calvinists, however want to also (paradoxically) affirm that salvation is not forced, but, as Patton argues, “a willing reaction of one who has been born again” and something “they will always choose due to their new inclinations” (link also see Kevin De Young here). Arminianism fully affirms “human depravity”. It also maintains that man does make the decision to respond in faith (or not) to the Gospel. But what Warfield (and others that make this criticism) ignore is that the decisive factor in salvation was God sending Jesus to die on the cross and cancel the debt of sin. Faith does not save. God saves. Faith is, however, the condition that God requires of all that would receive the benefits of the cross (ie forgiveness). It is a response (enabled by resistible grace) that accepts the need for God to provide salvation and trusts that Christ alone provided all that was necessary for salvation. In other words, the reason [God’s] predictions come true is because they are [God’s] purposes, and because [God himself] performs them. “God does bring about sinful human actions. … Somehow, we must confess both that God has a role in bringing evil about, and that in doing so he is holy and blameless. . . . God does bring sins about, but always for his own good purposes. So in bringing sin to pass he does not himself commit sin. Olson is correct when he notes that God is “sovereign over his sovereignty” and rejects the imposition of omnicausality. The point is that any and all limitations of God’s power and sovereign control to dispose his creatures as he wills is self-imposed either by his nature or his covenant promises. Why do Arminians reject omnicausality (aka divine determinism, meticulous sovereignty) and affirm people have free will to make decisions, including salvation? It is not to emphasize human freedom. Real Arminianism has always believed in human freedom for one main reason – to protect the goodness of God and thus God’s reputation in a world filled with evil. Olson argues that both Arminianism and Calvinism are God-centered. However, the God at the center is described very differently. The point in all this is simply this: it accomplishes very little to construct a God-centered theology if the God at its center is sheer, naked power of ambiguous moral character. I think we need to be careful here. The study of theology should focus on discovering and articulating truth about God. This goal should be pursued regardless of what the God at the center looks like. The Arminian argument should rest not on the assertion that the God at the center of Calvinism is “hardly distinguishable from the devil” and thus is not worthy of worship. It should be rooted in this: the God that Calvinism (logically) constructs at its center (and tries to avoid through paradox) is not the same as the One revealed in the grand narrative of Scripture. The God who stands at the center of Classical Arminianism is the God of Jesus Christ, full of love and compassion as well as justice and wrath who voluntarily limits his power to allow creaturely rebellion but is nevertheless the source of all good for whose glory and honor everything except sin exists. Grab a copy (Amazon) and join in. This entry was posted in Blogging Through a Book, Theology and tagged Arminianism, Calvinism, determinism, faith, free will, Grace, Grace for All, soteriology by MikeB (@AnAgileJedi). Bookmark the permalink.